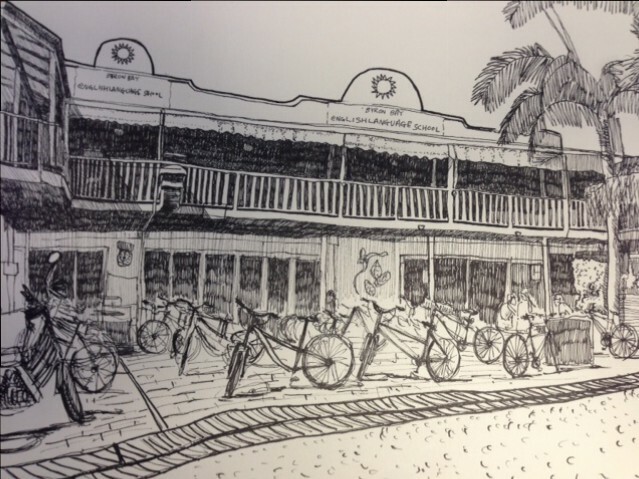 A view of Byron Bay English Language School as drawn by our talented Korean student Sungmin Han. Here at BBELS we have an interesting mix of backgrounds in our student population. We recently discovered that one of our long-term students, Sungmin Han, is quite a gifted drawer. Although Sungmin has never been taught the art of drawing it is easy to see that he is a naturally talented artist. Sungmin is currently studying in our IELTS course. He hopes to score high enough in the exam to enter a graphic design course at Lismore TAFE. We wish him the best of luck.